I've been to The Vortex several times recently with friends visiting from out of town (Washington, D.C.; Los Angeles, California; and Miami, Florida) and I order the same thing every time: their "Big Blue Buffalo Burger," which is drenched in their original buffalo wing sauce and topped with their thick blue cheese spread. 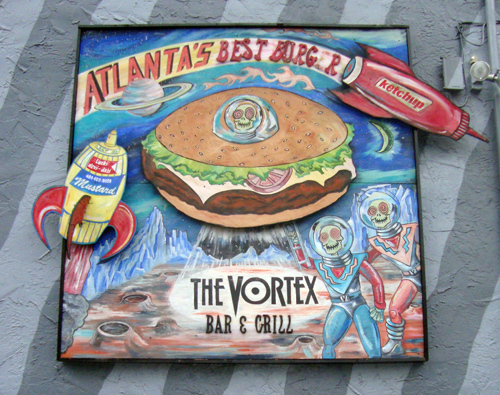 One of the best things about a visit to The Vortex (either their Little Five Points or Midtown location) is the menu. If it's your first visit, hang on to the menu and peruse it while you're waiting for your first course. I've said before that their "Idiot-Free Zone" policy is a favorite. Another is a warning under the heading "Read Our Menus" followed by "Everything you need to know about our food and beverage selection is printed somewhere within our menus. Please read them thoroughly. If you ask us stupid questions we will be forced to mock you, mercilessly." If you're the adventurous type, to the point of ignoring every Surgeon General warning ever, you might consider The Vortex's "Super Stack" burger. It's made with "two half-pound Vortex sirloin patties stacked inside three grilled cheese sandwiches, topped with two fried eggs, eight slices of American cheese, ten slices of bacon and plenty of mayo on the side." They choose the side item for this burger which is a big bowl of fries and tots covered in their "cheesy-cheese goo." If you actually finish it, you can get your photo (with the empty plate) published on their Facebook page! As a blogger, I wonder if I'm required by law to suggest that you consult with your physician before ordering a burger trademarked "The Triple Coronary Bypass?" Well, as The Vortex would say, "Consider yourself warned."